Samsung microwave ovens are in demand because they deliver high cooking power that can’t be received from other ordinary microwave ovens. If you are looking for a high quality Samsung microwave, please check Samsung MS14K6000AS that comes with impressive cooking features. This Samsung countertop microwave oven comes with sensor cook feature that is really a great cooking feature in this unit. Sensor Cook automatically adjusts cooking time so you don’t have to enter your own cooking time, this way it removes the guesswork. 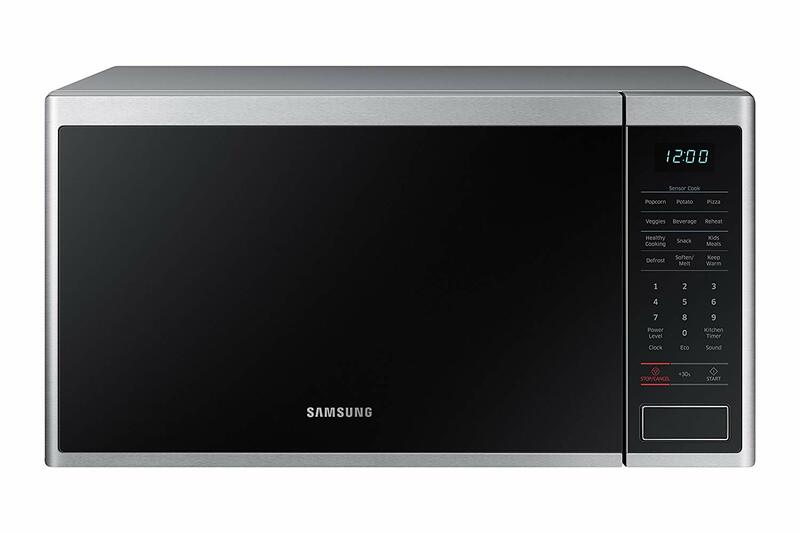 Most importantly, Samsung MS14K6000AS is good at sensing both humidity and heat to give the required heating power to the foods being cooked in the unit. Other advanced feature in Samsung MS14K6000AS is Triple Distribution System that advance the cooking power allocation so that it can prepare foods evenly and thoroughly. One more powerful capability of this Samsung microwave oven is the efficient cleaning capability. Yes, you can easily get rid of oil or grease from the surfaces so it becomes self-protective to scratches that may happen from day-to-day use. Further, Samsung MS14K6000AS microwave oven comes with ceramic enamel interior that is scratch resistant, which is very easy to clean. 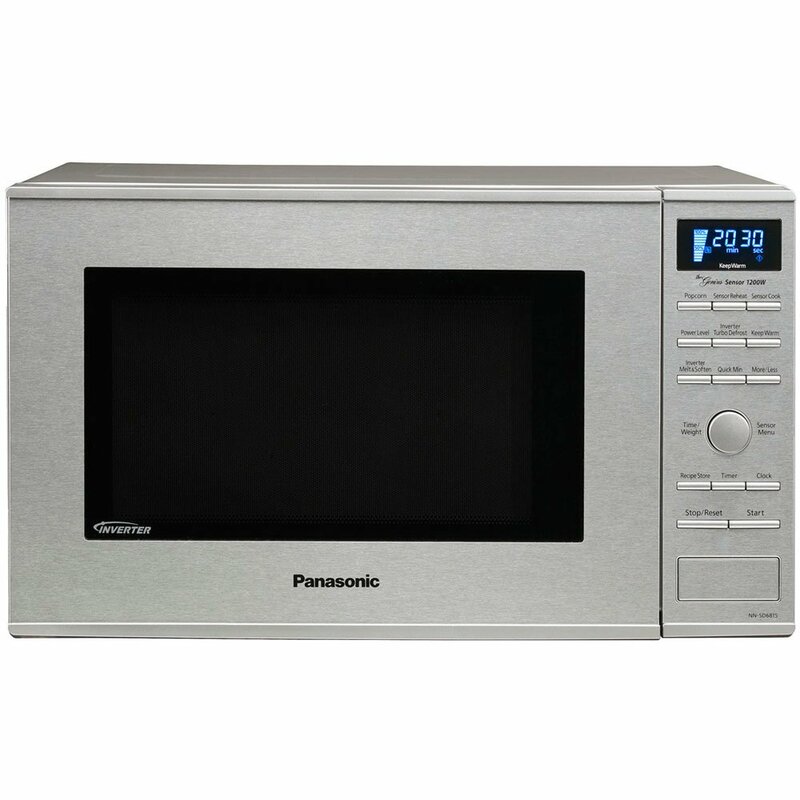 Seeing popularity and high rank of Panasonic NN-SD681S on Amazon.com, I can say that it is a popular Panasonic microwave. I see the price also, that looks an unbeatable price to me. If you are looking for buying a good Panasonic microwave, you should research and read more about this Panasonic microwave. Most of the Panasonic microwaves are based on the patented inverter technology, Panasonic NN-SD681S also uses the patented inverter technology. Since it is based on the inverter technology so it delivers even cooking meals with delicious flavor. In the advanced features of Panasonic NN-SD681S, you can find a smart four-digit blue LED display that has a programming icon dial and various buttons for the fast programming. 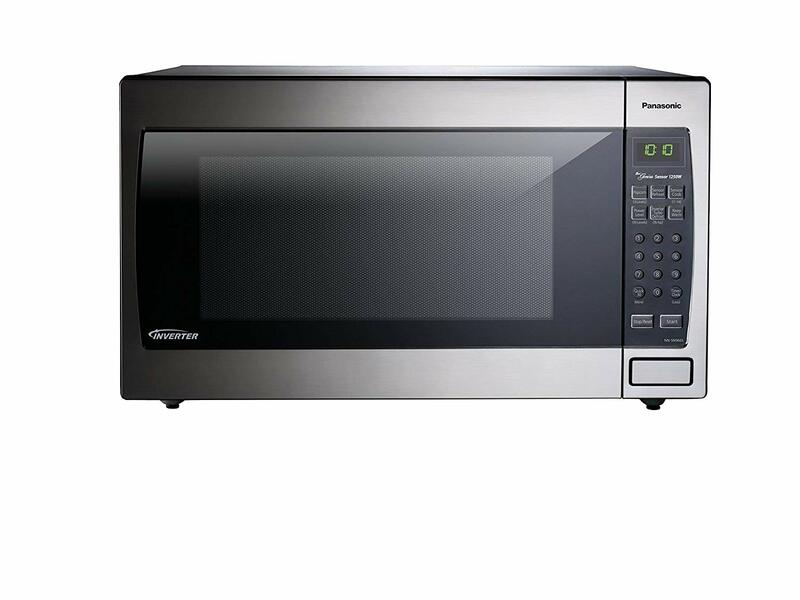 Panasonic NN-SD681S microwave is a 1200-watt unit that provide high cooking power. It comes with 1-touch genius sensor cook and reheat for automatic cooking settings. It also comes with keep warm button for keeping food stuffs warm for up to thirty minutes. When it comes to the energy consumption by Panasonic NN-SD681S then it requires 1480 watt power. Nostalgia countertop microwave ovens come with unique look that will surely delight you. The performance of these Nostalgia microwaves is awesome, you will receive good cooking performance without any doubts. 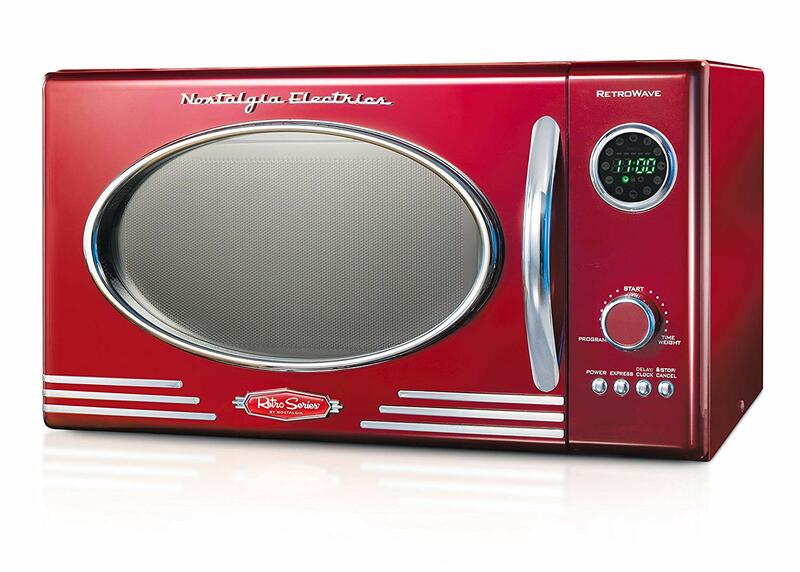 If you are looking for a performative microwave oven with advanced cooking features, you may check Nostalgia RMO400RED as well. Before you buy this unit, please research first so that you will be buying the right product as per your cooking requirements. Nostalgia RMO400RED comes with 800 watts of cooking power and it has 0.9 cubic foot interior space that are perfect for easy cooking. Since it has 0.9 cubic foot space so it is capable to hold larger food pockets, kitchen accessories, bowls and other cooking stuffs. Nostalgia RMO400RED microwave oven will surely provide you the best cooking experience you wished for. It has customized cooking settings of 12 pre-programmed options and delay timer. With such advanced feature, the Nostalgia microwave oven provides the best heating of your foods such as potatoes, pizza, popcorn, vegetable and many others. Further, Nostalgia RMO400RED comes with digital clock with easy-to-read LED display that lights up the digital clock and highlights each cooking setting for your cooking convenience. Of course, you receive even cooking result from this high quality Nostalgia microwave oven. Because it features rotatable glass carousel that helps in cooking meal evenly. If you are looking to buy a performative microwave oven in medium size from a popular kitchen appliance brand, please check Hamilton Beach microwave ovens. Because Hamilton Beach is a famous name in kitchen appliance brand that makes impressive cooking appliances at affordable prices. 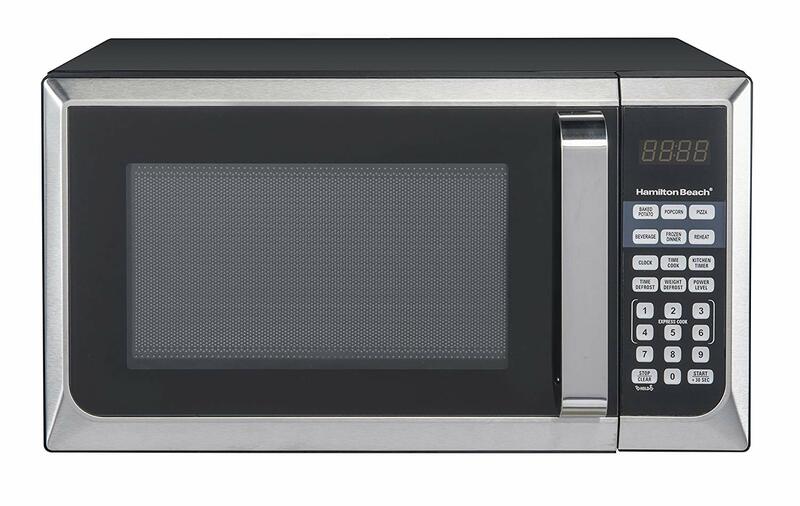 Usually, you find black stainless steel or stainless steel finish microwave ovens under the Hamilton Beach brand name. These microwave ovens comes with impressive cooking space, cooking power, power levels, touch pad control and many other advanced features. Hamilton Beach 0.9 Cu. ft. Stainless Steel Microwave Oven has 0.9 cu. ft. cooking space, which is really an impressive cooking space to accommodate most food items, accessories, bowls and other cooking related stuffs. Further, it comes with 900W cooking power, which is considered good cooking power to cook various foods without wasting your precious time. Further, Hamilton Beach 0.9 Cu. ft. Stainless Steel Microwave Oven has 10 power levels giving you the greatest cooking simplicity. Because you will be able to set power from 10% to 100%. Digital microwaves are also made by Black+Decker, you can check Black+Decker EM031MB11. It is feature-rich microwave oven that comes with various impressive cooking features. This microwave oven is available in different cavity sizes such as 0.7, 0.9, 1.1 and 1.4 cu. ft. interior sizes. You can choose an interior size based on your cooking requirements. Black+Decker EM031MB11 microwave oven comes with pre-programmed buttons for popcorn, potato, frozen vegetable, pizza, and beverage and dinner plate. Black+Decker EM031MB11 1000W 1.1 Cu. Ft. Digital Microwave Oven comes with 1000 watts of cooking power and 10 power stages for the greatest cooking flexibilities. It also has advanced features such as 30 seconds express cooking, kitchen timer and clock. Using these advanced features, microwave cooking will be a great time saver without any doubts. Further, Black+Decker microwave oven has 12.4 inches glass turntable, which is great for even cooked meals. If you are looking for inverter technology microwave oven that delivers good cooking performance, you can check Panasonic NN-SD372S as well. It delivers the best cooking performance because it comes with exclusive cooking features and capabilities. Panasonic NN-SD372S has 950 watts of cooking power and 0.8 cu. ft. capacity with stainless steel countertop to deliver a seamless stream of cooking power for even cooking and tasty flavor. Please don’t forget that the Panasonic countertop microwave oven is based on the patented inverter technology with turbo defrost feature. It generates a seamless stream of power and delivers consistent, evenly prepared food without overcooking. It comes with advanced inverter turbo defrost capability to speed up defrosting time. Further, Panasonic NN-SD372S carries a compact design because it has 11.25 inches turntable, which is thinner, lighter and more efficient. With such capabilities, the Panasonic oven is capable to devote less space to electronics and more to interior capacity. The internal dimensions are 8-1/8 inches by 12-3/8 inches by 13-7/8 inches. Further, Panasonic NN-SD372S microwave comes with smart cooking settings with genius sensor. It has automatic genius sensor that adjusts power and time based on different foods. And who doesn’t love smart cooking settings with genius sensor? The Panasonic countertop microwave oven has built-in automatic Genius Sensor that adjusts power and times based on different foods. The Genius Sensor feature also comes with preset menu items, quick-minute timer, delay start and child safety lock. Danby is a big name for many kitchen appliances including impressive microwave ovens. 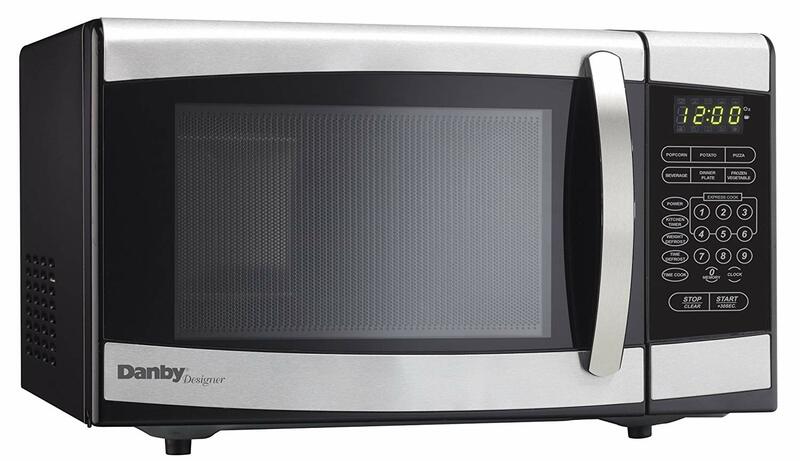 If you are looking for a performance oriented microwave unit, you can check Danby Designer 0.7 cu.ft. Countertop Microwave that comes in various interior sizes such as 0.7 cu. ft., 0.9 cu. ft., 1.1 cu. ft., 1.4 cu. ft. in black and white colors. You can choose a color or interior size that best fit your requirement. Danby Designer 0.7 cu.ft. Countertop Microwave comes with 700 watts of cooking power. Such impressive cooking power can surely give you amazing cooking experience to cook almost anything you want. Further, 0.7 cu. ft. capacity is a medium-range of cooking capacity to cook foods for a medium size family. This is a stylish microwave oven in black and stainless steel exterior that will surely complement your kitchen décor. Farberware FMWO11AHTWHC 1000-Watt Microwave Oven comes in white color exterior that looks very stylish in any kitchen interior. It will surely beautify the decoration of your kitchen. Most importantly, this is an affordable Farberware microwave oven that sells below $100 price tag on Amazon.com. 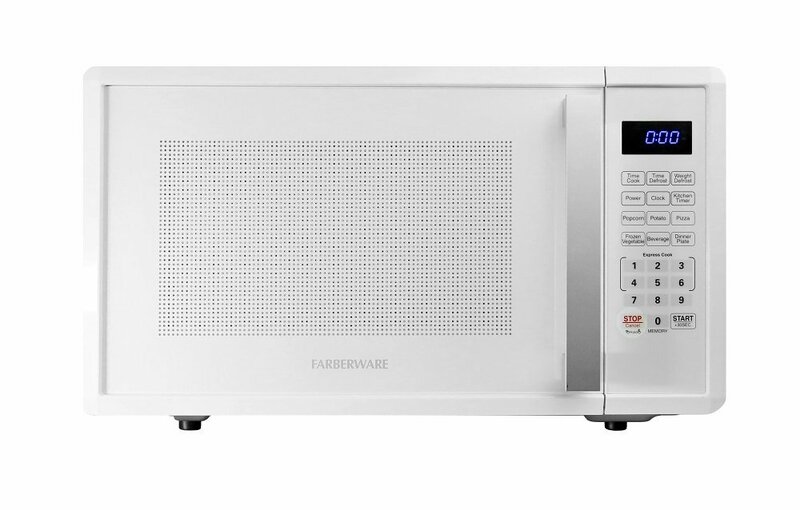 The Farberware microwave oven has 1.1 cubic foot cooking capacity and it can impressively fit on your kitchen counter. Further, it comes with 1000 watts of cooking power that is considered impressive cooking output to cook various foods seamlessly. On the other hand, using the 10 power levels you will have great cooking precision as you will be able to adjust the power from 10% to 100%. If you are looking for one-touch cooking functions then Farberware FMWO11AHTWHC will not disappoint you. It comes with 6 x 1-touch cooking functions such as pizza, potato, popcorn, dinner plate, beverage and vegetable. Other advanced features of this Farberware microwave oven are a digital control, an LED display with clock and kitchen timer, 1 through 6-minute express cooking quick start controls and add 30-secons control. Most importantly, the Farberware microwave oven comes in the right size, inside and out. It has 1.1 cubic feet capacity that fits neatly on a countertop and is perfect for warming a bowl of soup, a few slices of pizza or a casserole for two. GE JES1097SMSS Smart Countertop Microwave Oven is available in two styles such as GE Microwave and GE Microwave + Echo Dot. This is a voice enabled kitchen appliance because it works with Alexa that control this product with your voice through select Alexa devices. 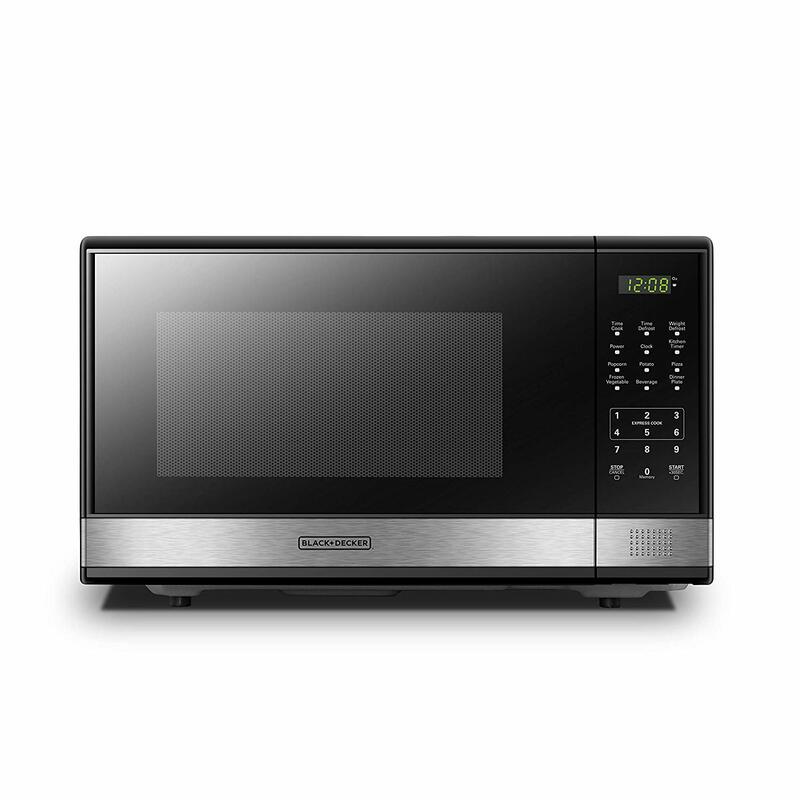 If you are looking for a modern microwave oven, you can check GE JES1097SMSS Smart Countertop Microwave Oven that works with Alexa for voice control. Please make sure that the Alexa devices are sold separately. You just need to enable Alexa Smart Home Skill U+Connect, download user manual in technical specification section for step-by-step instructions for the installation. GE JES1097SMSS Smart Countertop Microwave Oven has wi-fi connect feature that works with Alexa. You can speak directly to Alexa to get the best kitchen ease to cook, defrost or reheat. Further, GE JES1097SMSS uses Scan-to-cook technology that removes the guesswork out of frozen food instructions. You will be able to cook with the right settings with the GE appliances kitchen app. You just need to scan the barcode and the microwave is correctly programmed to the right power level and cooking time. Thus, it makes your food turn out just as the manufacturer intended. Further, GE JES1097SMSS Smart Countertop Microwave Oven comes with 7 pre-programmed sensor menu options. These menu options are dinner plate, popcorn, pizza, beverage, potato, vegetable and reheat. 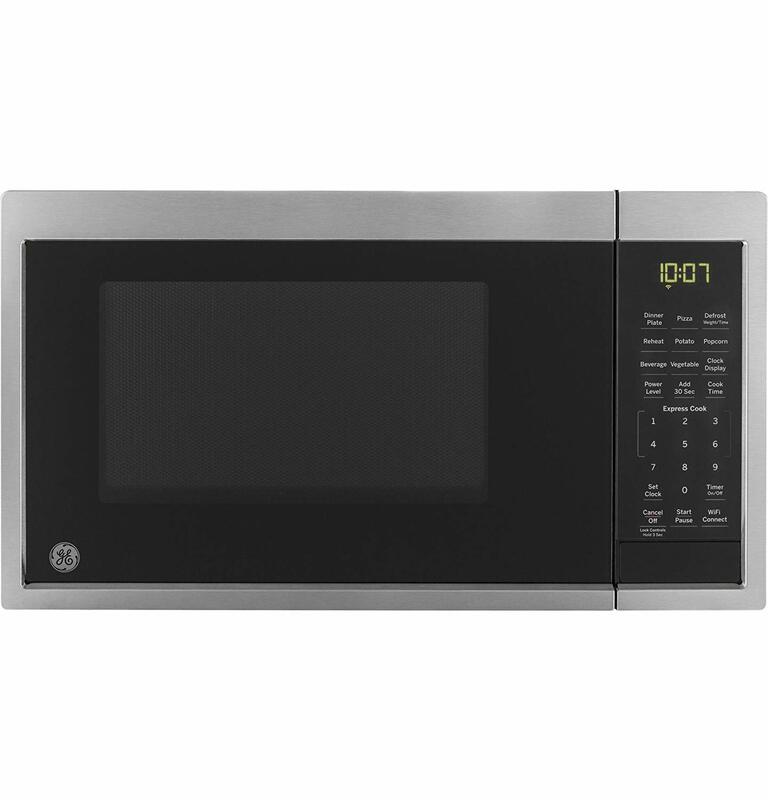 GE countertop microwave oven has stainless steel exterior that measures 11.5 inches high, 19 inches wide and 14.5 inches deep. It has 0.9 cubic feet capacity. The cavity measurement is 13.7 inches by 8.7 inches by 12.4 inches. The turntable measurement is 10.5 inches in diameter. Shipping weight is 30 lbs and net weight is 28 lbs. Panasonic Countertop Microwave Oven NN-SN966S Stainless Steel with Inverter Technology is certified refurbished product, which is well tested to look and work like new. In the refurbishing process, some major factors have been considered such as functionality testing, basic cleaning, and inspection and repackaging. 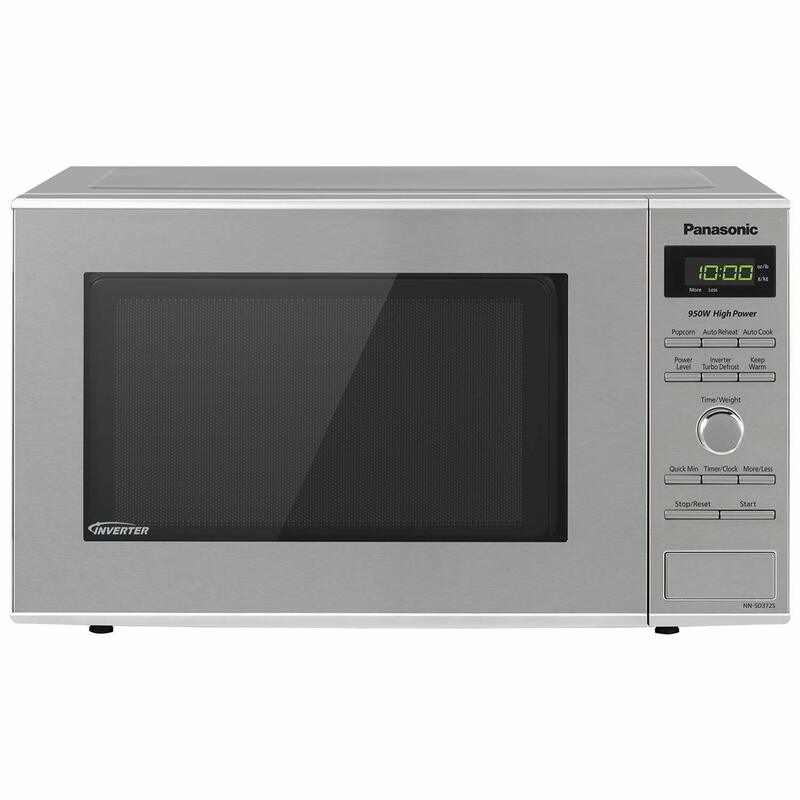 Panasonic Countertop Microwave Oven NN-SN966S Stainless Steel with Inverter Technology is shipped with all relevant accessories and with 90-day warranty. You are requested to select those sellers at Amazon, who maintain a high performance bar may offer certified refurbished product on Amazon.com. Panasonic Countertop Microwave Oven NN-SN966S has 1250 watts of cooking power, 2.2 cu. ft. interior capacity, stainless steel countertop in this microwave oven can surely deliver a seamless stream of cooking power for even cooking and delicious flavor. Panasonic Countertop Microwave Oven NN-SN966S is the best fit for large family size because it comes with 16.5 inches turntable, which is thinner and lighter and more efficient. With such powerful capabilities, it takes less space in your kitchen and while it comes with more interior capacity. Internal size measurement is 10.94 inches by 18.44 inches by 18.50 inches.